Tracy from A Slice of Smith Life just won my Blogoversary Giveaway and it turns out she has a giveaway of her very own, I didn't really want to share this information because I want to win the jewelry set for my mom, who absolutely adores handmade jewelry; but I must not be greedy and allow others a chance to win too! A Slice of Smith Life for the whole wonderful story; but hurry because entries close Tuesday, August 31 at 9:00 PM EST! 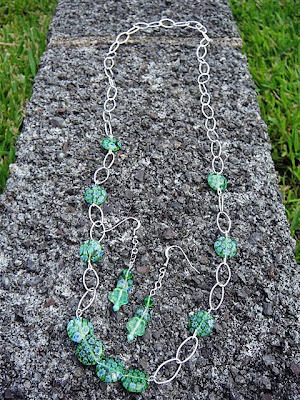 This long necklace is silver-platted with green clear beads with small blue flowers in the beads. The matching earrings are surgical steel that are hooked backs. 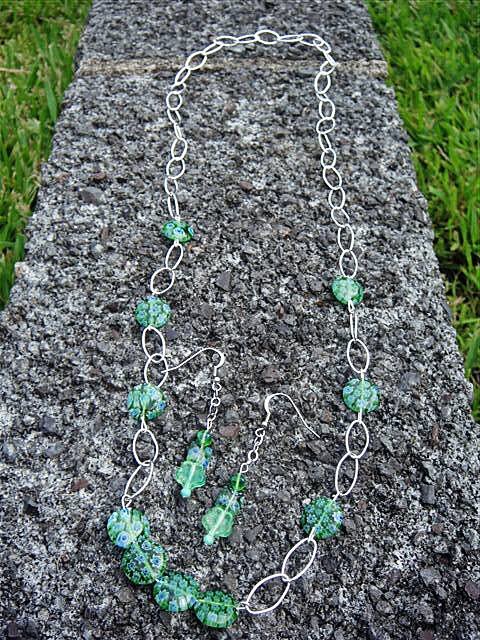 The earrings are also the same green color beads as the necklace with small blue flowers in them. Have a great day! Enjoy your blogoversary and thanks for making my birthday this year a memorable one!